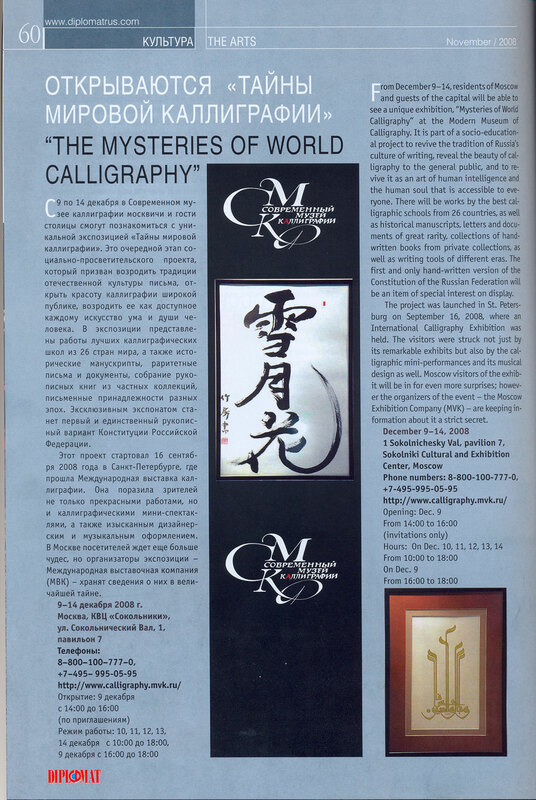 From December 9th – 14th, residents of Moscow and guests of the capital will be able to see a unique exhibition, “Mysteries of the World’s Calligraphy” at the Modern Museum of Calligraphy. It is part of a socio-educational project to revive the tradition of Russia’s culture of writing, reveal the beauty of calligraphy to the general public, and to revive it as an art of human intelligence and the human soul that is accessible to everyone. There will be works by the best calligraphic schools from 26 countries as well as historical manuscripts, letters and documents of great rarity, collections of hand-written books from private collections as well as writing tools of different eras. The first and only hand-written version of the Constitution of the Russian Federation will be an item of special interest on display. The project was launched in St. Petersburg on September 16th, 2008 where an International Calligraphy Exhibition was held. The visitors were struck not just by its remarkable exhibits but also by the calligraphic mini-performances and its musical design as well. Moscow visitors of the exhibit will be in for even more surprises; however the organizers of the event, the Moscow Exhibition Company MVK, are keeping information about it a strict secret.